Commissioner Jon Olefson asks a question of attorney Timothy Hollister regarding the Hiawatha development application at the Planning and Zoning Commission meeting on Thursday, April 11, 2019, in Westport, Conn.
WESTPORT — A strong front of opposition met the application for the Hiawatha Lane 8-30g affordable housing development Thursday night at the Planning and Zoning Commission meeting, with commissioners themselves sharing high levels of concern. The hearing for the five-building, 187-unit multifamily project was continued to April 25 at the request of attorney Timothy Hollister of Shipman & Goodwin, LLC, on behalf of Summit Development. A vote is likely to take place that night. Two items related to the approval puzzle raised particular concern — pedestrian safety in the neighborhood and an emergency access road via Norwalk. Hollister stated that in order to assuage concerns of Fire Marshal Nate Gibbons about fire department access, the intention was to get the city of Norwalk to approve an access road to the complex via the adjacent Avalon East Norwalk development, which lies to the west of the 9-acre parcel. 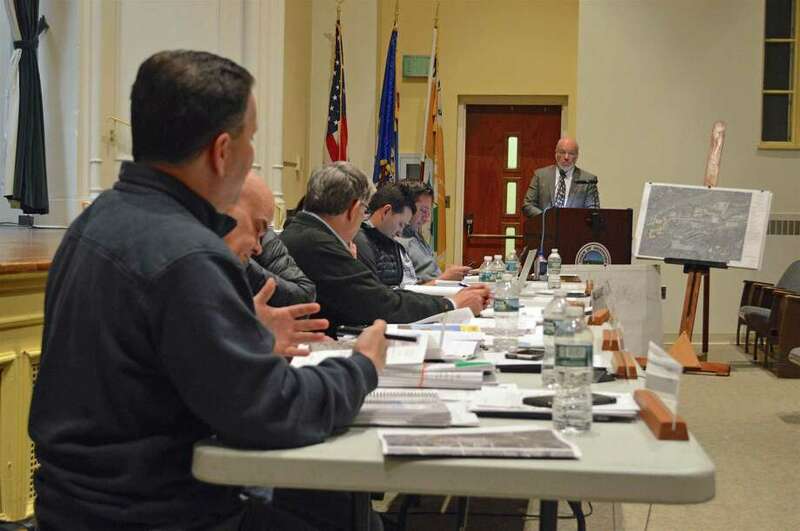 “They said to us, ‘When you know the position of the Westport Planning and Zoning Commission, we will be ready to hear,’ ” Hollister said of Norwalk’s officials. “This project has been in the works for years (so) it’s kind of troubling to get to this point and not have our sister town’s approvals in line,” Commissioner Chip Stevens said. But Matthew Mandell, Representative Town Meeting member for District 1, which includes this neighborhood, said Norwalk would never sanction the access road because of a previous agreement with Westport. Citing a 2006 “mutual restrictive covenant” he said was put in place with the previous owners of the land prior to the construction of Avalon East Norwalk development, the agreement was an access road would never be opened that could create additional traffic in and out of Westport. “No way is Norwalk going to approve it (because) Norwalk has already agreed to not have that happen because they were looking to protect Westport,” Mandell said. He also said the applicant has known all along that the road could never be built, but chose to deflect attention from it. Construction of a sidewalk — or a lined walkway — out to Saugatuck Avenue to abet pedestrian traffic to the train station was, likewise, presented as being contingent on another entity, in this case the town of Westport. While site engineer Mark Shogren said there was room in the town’s right of way, it would require doing away with on-street parking on at least one side of Davenport Avenue, something that’s been a regular feature in the neighborhood for a long time. Hollister, who noted that people are now “parking illegally,” said it amounted to a positive amenity and safety improvement opportunity for the town, but commissioners didn’t concur. “I do think you have an ethical dilemma in representing your client against the town,” Olefson told him. “I’m a little annoyed that we’re in April and you’re just now getting around to pedestrian safety,” Chairman Paul Lebowitz said. Asked to speak to fire safety issues, Gibbons said the proposal to have a dry hydrant that accesses water through an on-site 52,000-gallon cistern was questionable, given the Westport department’s inexperience in using one, as well as potential issues of equipment reliability. Former Fire Chief Andrew Kingsbury, who appeared as a peer review consultant, said two or three cisterns should be used, especially as the one would still necessitate around 250 yards of fire hose to reach the far side of the complex in an emergency. He said the neighborhood, once the complex is built, becomes a “target hazard” as far as fire safety is concerned. “We’re talking about tripling the size of the neighborhood,” Gibbons said.